I don't care for gory Halloween decorations and treats, so I fell in love with these adorable and scrumptious spooky white chocolate-coated pretzels when I first saw them on the internet. I had so much fun making them with my grandson! We chose to use chocolate chips for the eyes, rather than the candy eyeballs as suggested in the original recipe; however, either are truly cute. 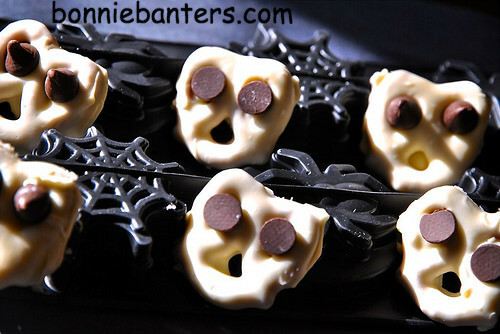 I love how easy these delightful and delectable ghosts and ghouls are to make, and you will too. Plus, who doesn't love sweet and salty! Using a fork, immediately dip the pretzels, one at a time into the melted chocolate. Shake off the excess chocolate with the fork...shaking the chocolate out of the bottom hole as much as possible so it looks like a screaming open mouth. Place on the lined baking sheet. After you've dipped about a half dozen, immediately press two chocolate chips into the top two holes for the eyes. Place the chips either with the tips up or down, or do a combination of both as in the photo. Here's a thought...try one chip with the tip up and one with the tip down on the same pretzel...that's a little freaky! Just have fun! Let the pretzels rest until the chocolate has hardened. Place in the refrigerator or freezer for a few minutes if you want to quicken the process. Carefully remove the pretzels from the baking sheet, serve on a platter or Halloween plate and enjoy! * Store in a covered container in layers separated by sheets of wax or parchment paper. Alternatively, use white chocolate coating (or bark or melts) for the white chocolate chips...skip the coconut oil or shortening and follow the manufacturer's directions for melting. Substitute raisins, black jelly beans, or the candy eyes, if you prefer, for the chocolate chip eyes. For Halloween party favors, place the pretzels into individual cellophane bags and tie with pretty ribbons. Have fun with the kids and enjoy a Spooktacular Halloween with these whimsical and scrumptious white chocolate-coated spooky pretzels!